Please note that Loud Siren (powered by Debix) has been discontinued and is no longer available. 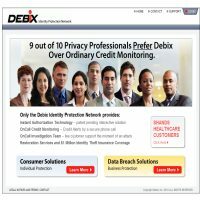 You can read our old review of Loud Siren (powered by Debix) below, or check out the rest of the Identity Theft Protection Services we've reviewed. Loud Siren, brought to the market by Debix, is the cheapest service that we have reviewed in this entire category. At just $9.95 for a full year's membership, we were excited to check out what Loud Siren had to offer. Debix is one of the biggest players in the commercial identity theft protection market, and has recently branched out into the consumer market by purchasing Loud Siren. The multi-million dollar US based firm offers the cheapest, but unfortunately also one of the weakest services to its users, and we were pretty disappointed by what Loud Siren actually gave us for our money. In terms of features, it's undeniable that Loud Siren is fairly limited in its offerings to its consumers. The mainstay of the Loud Siren service is the provision of fraud alerts on accounts with the major credit bureaus. While this service does provide some advanced warning of the potential threat of identity theft, and can in many cases stop the crime from occurring, this does not stop those elements of identity theft and associated fraud that do not happen through the channels of a normal credit application. We were disappointed that Loud Siren did not offer web scanning, by performing daily searches of public websites, trading websites and public records for the protected data (Social Security Numbers, Name, Address, Credit Card Numbers, etc.) of its members. If Loud Siren were to offer a useful service such as web-scanning, it would undoubtedly encourage more prospective customers to sign up. A redeeming feature of Loud Siren is its post-fraud support. Loud Siren is particularly accomplished at putting its users in contact with a range of specialist identity theft response organizations, which can help speed along the recovery process. We couldn't help but feel that despite Loud Siren being considerably cheaper than many other services, it really didn't offer enough to actually warrant going through the process of signing up to the service! Loud Siren really doesn't seem to do a great deal for the $9.95 per adult member. Although we normally praise services that offer watered-down alternatives to the major players (at a significantly reduced price, of course), because they open up the market to a wider audience, in this case we can't help but feel that users won't really benefit a great deal from what Loud Siren is offering. We would definitely recommend checking out other services that, while often more expensive, will provide a wide range of features that will contribute to a far more encompassing service. For comparison, check out LifeLock, our highest rated service in this category, which (though considerably more expensive) offers a much more developed service, with a range of useful additional features. If you still feel like giving Loud Siren from Debix a go, however, you can visit the site by clicking on the button below. Please note that Loud Siren (powered by Debix) has now been discontinued.